The Martin Luther King, Jr. holiday reminds us of the importance of serving the community and lending a hand where we can. 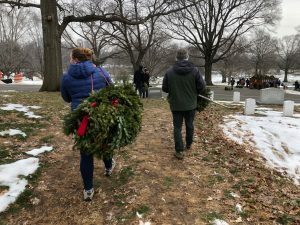 Over the holiday weekend, TCG had two Charity Sprees in flight — one at the Maryland Science Bowl and the other at Arlington National Cemetery with Wreaths Across America. 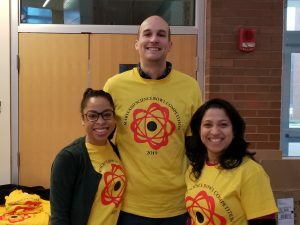 The U.S. Department of Energy (DOE) National Science Bowl® is a nationwide academic competition that tests students’ knowledge in all areas of science and mathematics. Teams from Maryland high schools competed in fast-paced challenges and were tested in biology, chemistry, Earth science, physics, energy, and math. TCGers volunteered as scorekeepers, timekeepers, rules judge, and helped with registration. TCG has made a special commitment to support STEM education for women and minorities this year. As such, the company was eager to sponsor this event and lend a helping hand. Charity Sprees are just one of the ways TCG fulfills its mission to improve the world around us, in big and little ways, every day. Harkening back to what Alison said, it only takes a few hours to make a significant impact in the community. And, despite the fact that many of the volunteers were on furlough due to the government shutdown, TCGers still upheld the company’s Core Values and went the extra mile to help where they can.